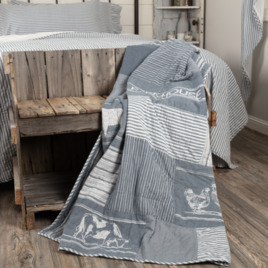 The Sawyer Mill Blue Farm Animal Quilted Throw uses patterns from the Sawyer Mill Blue quilted throw featuring denim blue & soft white mixed with farm animals & farmhouse themed pictures to give a modern country look with a touch of vintage charm. 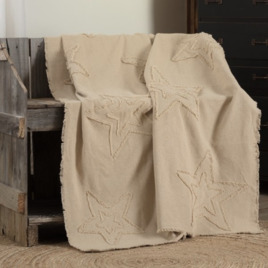 The Farmhouse Vintage Burlap Star Throw takes is a warm blend of antique creme burlap decorated with fringed double stars. 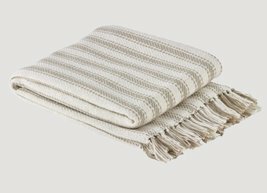 The ultra soft burlap makes this throw perfect for a cozying night! Reverses to solid antique creme. 100% cotton. 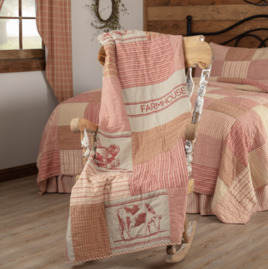 The Sawyer Mill Red Farm Animal Quilted Throw uses the same patterns from the Sawyer Mill Red quilted throw featuring country red, dark tan, and creme mixed with farm animals and farmhouse themed pictures. 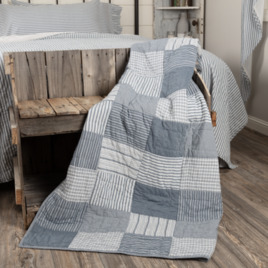 The Sawyer Mill Blue Block Quilted Throw brings a unique design with vintage stripes, microchecks, & blue chambray coordinated in a simple block layout to create a farmhouse, vintage feel. Layers beautifully over furniture with decorative pillows.